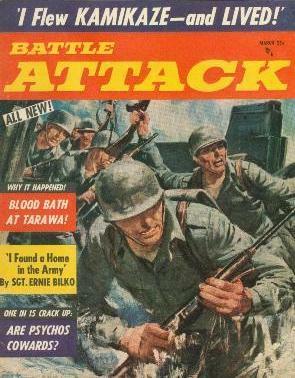 The first story in the first issue of the men's adventure magazine Battle Attack, launched in 1957, comes from a supposed former Kamikaze pilot who now lives in Singapore's Chinatown. The tale from Li Hai Chi, the assumed name used by the former Kamikaze pilot, has the markings of fantasy rather than history despite the magazine's presentation of his account as being true. Even on the story's surface, it seems far-fetched that a former Japanese Kamikaze pilot would move to Chinatown in Singapore after the war's end when considering what the Japanese military had just done to Singapore and China. Li Hai Chi's motivation to make this move never gets explained, and his apparent ability to now converse in both Chinese and English seems unbelievable. Moreover, almost no Kamikaze pilots survived an attempted suicide attack on an enemy ship. The author never provides any details such as air base names and specific dates in order to allow verification of Li's account, and this tactic is most likely intentional to conceal that the article has no basis in actual history. 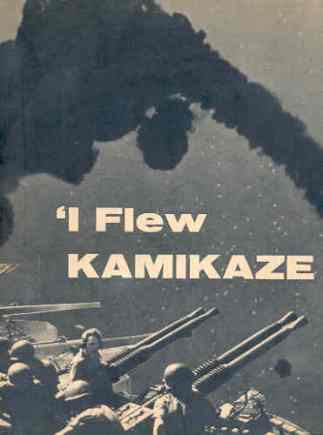 The interviewer and article's author clearly do not view Kamikaze pilots with objectivity based on his use of such phrases as "fabulous corps of suicide fanatics," "secret group of hopped-up killers," and "cult of young Japanese servicemen." Notes have been added to the story in order to provide comments on a few inaccuracies. Click on the note number to go to the note at the bottom of the web page, and then click on the note number to return to the same place in the story. Kamikaze! A screaming, whining streak of death roaring down from the skies! A Japanese fanatic tells how he piloted his plane toward certain battle suicide—yet survived! "I was a Kamikaze flyer. I tried to ram my dynamite-laden plane down from the clouds onto one of your American warships to blow it to Kingdom come. An unforeseen accident prevented my success. True—I would have been blown to bits, if I had hit your ship. But this does not matter. I would have been proud to die." "In a new war, if they asked you to fly a Kamikaze plane again, would you do it?" "If it were to serve my country—yes!!" Li Hai Chi, solemn, sallow-faced, slightly stooped, looked as though he meant every word of it. There was nothing boastful about him. But there was a gleam of quiet, nostalgic pride in his dark, squinty eyes, as he spoke of his war record. He also looked as though he needed glasses. Today, Li Hai Chi works as a sales clerk of an antique shop in the Chinatown of Singapore, the great seaport and fortress at the lower end of the Malayan peninsula. Li Hai Chi is an assumed Chinese name. The former Japanese suicide pilot did not wish to give his real name. Kamikaze was Japan's own terrible secret weapon in the second world war. Never before Pearl Harbor had the world heard this word . We all knew stories of Japanese men who threw themselves onto their swords, committing Hari-Kari after they had done a dishonorable thing and felt that they no longer could face the world. But this sort of suicide, Kamikaze, was something new. It referred to a cult of young Japanese servicemen, both in the submarine and air corps service, who had sworn to attack the enemy without mental or physical reservations. By throwing away their lives in a frenzy of self-sacrifice, they hoped to inflict greater damage upon the enemy than soldiers in ordinary combat, where the instinct of self-preservation robbed many men of that last bit of deadly efficiency. To kill well, you had to be ready to die yourself. Kamikaze pilots died by the hundreds. At home a devout Japanese nation erected the Jasukuni shrines in their sacred memory , as though these young men had been gods. None ever seemed to come back. It was all like a miracle. He himself is unable to explain it. At first glance it was hard to believe that this young, emaciated looking man had once been a member of that fabulous corps of suicide fanatics who struck terror in the hearts of the bravest American naval men. He was skinny. His walk was slow. He dragged his feet. His shoulders were bowed and lazy. His boss, the Chinese antique dealer introduced him: "This is Li Hai Chi. He is the greatest curio in my whole shop." The young man was not keen to talk. It took some coaxing to make him speak. Once he began, all doubts vanished. This man was genuine. No outsider could possibly have known so much about this secret group of hopped-up killers. "Yes, it is true." said the pale young man with the slanted eyes. "I was a Kamikaze flyer. I was fortunate—or unfortunate, however you look at it. I once attacked an American warship from the air to blow it up. I did all that was asked of me. I came out alive. I think I am one of the very few. It was toward the end of the war. The instruments in our planes were sometimes a little faulty. Some of us suicide flyers missed our targets and fell in the water before we could complete the attack. Some of us were saved." Li talked slowly, as though it was hard to bring back the memories. "Did they force you to join the Kamikazes, Li?" "Force?" Li sat up stiffly. "Oh, no! It was a great honor to be accepted by the corps!" "But didn't you know that that you were expected to go out and get yourself killed?" "Aren't you Americans also ready to give your lives for your country?" "Sure, we are. But not like that! I don't think we would find too many willing to go into battle like you fellows with no chance whatsoever to come back. Even with a chance of one to a hundred against them, our guys figure that they may come out alive!" "Well, in Japan we always had more volunteers for the Kamikaze Corps than planes for them to fly." "Because to be a Kamikaze made you something special. We were the elite of the armed forces. They treated us better than even high government officials . During the training period we had the finest food. Why, even while we were in flying school we were decorated with high medals of merit, before we had a chance to earn them ." "Perhaps they gave you the decorations before your missions because they knew they could not hand them to you afterwards. You'd be dead." "That is exactly the reason. We were proud. Only one man ever pretended to be ill just to get out of the Kamikaze Corps. He was a coward." After a short pause, Li added: "But he was not pure Japanese. His father was from Polynesia." "Only one." Then with a wry smile: "How many of us had the chance to fly a second one? Most of us did not live long enough." "What training did they give you, Li?" "It could have been better." This was the first critical word about anything Japanese coming from the lips of the former flyer. "Some of our men had no more than ten hours of instruction when they were sent into combat. That cost many lives. Your American ack-ack was very good and very tough. Also, how could such badly trained flyers escape your American pursuit pilots who were superb?" "What sort of planes did they give you?" "As I said, toward the end of the war they were not the best. They were only good enough to carry us and our explosives over the American Navy. Sometimes I wonder how our men managed to get through your flak fire in their outmoded crates." "Then how did you manage to survive your own attack upon an American warship?" "I sometimes still wonder about that myself!" Li stared ahead, his calm, immovable face expressing the serene philosophy of so many Orientals. "I guess even the gods don't know the answer . . . It was shortly before you Americans attacked Okinawa. We in Japan were in bad shape. Your navy had all those big aircraft carriers and so many swift planes. What did we have left? Where were our ships? Who knows?" "Li, did you ever see a Kamikaze hit an American ship and sink it?" "Of course, I did! . . . But let me continue first: I will tell you about that in a little while. As I said, it was near Okinawa. There were six of us scheduled to fly that day and attack your ships. The weather was clear. We all said our final prayers and bid our buddies farewell. We did not expect to ever see them again. There were no tears. "I had written to my father and mother and commended my soul to them. My father was very proud of me. He sent me a special prayer written on a silken sheet of paper. I placed it in my plane and then taxied up the runway to take off with the other five." "Did you think of death?" "No! I was exhilarated about what I was about to do. I felt an urge to get into the air as quickly as possible. Soon we were aloft. After flying for little more than thirty minutes we discovered your ships at the horizon . They were like little toy boats far, far away, down on the water. Our propellers were droning on, taking us closer and closer to your ships. We flyers wore our special ceremonial uniforms: black tunics with special black buttons , each decorated with the emblem of the cherry-blossom. "As we approached the station above your ships we tried to anticipate what your captains would do. No doubt they would be aware very quickly of the purpose of our arrival. With so many American vessels and their tremendous firing power bunched together their logic would tell them that only one type of Japanese plane would dare to invade such dangerous territory—we, the Kamikazes. I felt proud to know that I would instill fear in the hearts of the Americans. We had been told by our intelligence agencies that you Americans still found it difficult to believe that soldiers of any nation would volunteer for certain death as we did. This was against all concepts of American philosophy. Don't forget I am talking about a period when our Japanese idea of Kamikaze attacks was still a new phenomenon to the world. Our government did not employ Kamikaze until the latest stages of the war. To us the thought of going into death with open eyes was nothing. It was a modern form of Hari-Kari—a most honorable form." Li smiled a little. There was an expression of infinite pride in his weary face. Skinny, stoop-shouldered, nearsighted he was. But the spirit encased in this insignificant body was something to behold. "As our planes came nearer the target area, your captains did what we had expected. They became trigger-happy and let go with every cannon aboard their ships, even when we were still out of range of your big guns. It was an awesome spectacle to look down and watch hot flames shooting from the muzzles of hundreds of guns, from the biggest cannons to the fast-firing machine-guns. They spit an endless stream of steel and shrapnel high into the sky, where we were. In no time we were floating in a heavenly Hell, dotted with countless black clouds all around us, hurling sharply ragged fragments of exploding shells at our shaky aircraft." American pilots who braved Adolf Hitler's flak over Berlin will truly appreciate Li's feelings. "But we had been trained to keep going. Not to turn back. So—we flew into your Hell of lead and steel. I lost track of the other five pilots. There were too many black clouds all around me and too many lightning flashes of exploding flak." Li stopped for a moment. The memories came too fast. "I was forced to forget the other Kamikazes. Danger or no danger, I was here to do a job. While your ships did their best to shoot us down in the midst of all this bedlam, I had to pick my target down there on the water. My plane was loaded with explosives. These I desired to ram onto one of your ships, to rip it in two. My eyes darted below to find the biggest American ship. We had been told to dive through your shrapnel, get as close to your ship as possible and aim for the ammunition dump aboard if at all possible. Otherwise try and hit the funnel and leave the rest to the explosives on our own planes. If we managed to escape your flak, we would come down so fast that no ship could get out of our way fast enough. If our aim was true, your ship was lost. A carrier or heavy cruiser would be put out of commission for several months by one direct Kamikaze hit. A light cruiser or destroyer would be ripped in two and sunk at once. These were our calculations. And that is why everyone feared us." Again a proud smile played around the lips of Li Hai Chi. The memory of the fear he had thrown into the hearts of men, his short moment of greatest glory, exhilarated him again. "This fear which we caused gave us greater courage. It lifted our spirits. We Japanese do not attach too much value to life itself. If we can perform a deed of great valor, which will bring honor to us and our house—what is life compared to that?" Then Li Hai Chi described how he saw one American destroyer go down under the terrifying impact of a Kamikaze smash. It was to his left. One of the other five pilots had spotted the ship and taken a bead on it. The hapless commander of the American vessel was unable to get away from under the screaming, whining streak of death roaring down upon him from the clouds. The Jap plane rammed into the ship dead center. Li, looking down, saw a mighty explosion. "A tremendous cascade of fire spurted up to us. Ten seconds later your ship and my buddy's plane were gone. There was nothing left but a huge oil spot covering the ocean and many pieces of debris. "I had picked a heavy cruiser for my attack," continued the Japanese. "With the ear-splitting racket of the shrapnel blowing up all around me, I pushed my stick forward. I began to fall. My speed was murderous. I aimed for the big ship. I went down faster and faster. This was it. Now I would fulfill my duty as a Japanese soldier. Banzai! Not for a second did I dwell on the thought that these were the last moments of my life. I just wanted to do as my buddy had done. Hurt the enemy. Kill the enemy! I saw nothing but this ship growing bigger and bigger. I was in a frenzy. "Suddenly my plane shook as though it had been hit by an earthquake. I tried to look around. I saw a big hole in the side of my fuselage. I was still falling at blinding speed. Through the hole I felt an icy wind strike at me. I became very angry. The big ship I was aiming for was not firing. But the destroyer next to it was sending up tons of steel. In a split second I decided that the destroyer had ripped that hole into my ship. This was an insult. In fiery anger I decided to alter my course downward. I wanted to kill this destroyer. I saw its cannons roar up at me and saw fire and smoke come up toward me. And I did not even have a pistol to fire back." "But you had full possession of your senses, Li? What went through your mind during this sizzling approach?" "You will not believe me, but I did not think of death. It was like going down in a fast parachute. I was not afraid. I was seething with anger. I just wanted to hit back. As I hurtled down, I saw your ship grow bigger and bigger. All of a sudden I saw it very big under my propeller. I saw your American sailors throw themselves flat on the deck. Then I felt a violent shock and lost consciousness. "When I came to, I was dismayed to discover that I was in the water. Your ship was nearby. It seemed bigger than a house. Your American captain had had great presence of mind. As he saw me coming down upon him, he had thrown the rudder around and veered slightly off his course. This added to the fact that I had changed directions on my way down caused me to miss your ship and smash into the water. One wing of my plane broke off. The whole thing sank quickly. The explosives never went off. I was very angry. Hitting the water so close to the ship, I could still have ripped a great hole into the side of your destroyer, if my dynamite had exploded. Perhaps I did not have enough speed when I hit the water." "What happened to you after that, Li?" "I thought the American sailors would shoot me in the water. It would have been a most dishonorable way to die. But they did not fire upon me. They pulled me aboard. I was pushed around by some of them in understandable anger. I thought I would be lynched. I guess they could have done it. Had it not been for a miscalculation on my part they all would have been dead now due to my action. Then, to my surprise they gave me food and let me keep all my possessions, except my tunic. They all wanted the black buttons with the cherry blossom emblem as a souvenir. I became a prisoner of war in the Philippines until the fighting ended." "If Japan engages in another war, Li, would you fly Kamikaze again?" "If it is to serve my country—yes." "Why are you not in Japan right now, Li? Why do you work here in Singapore?" "When I returned to Japan after the war I could not find my father and mother, nor any of my family. You see I was born and raised in a city called Hiroshima." 1. The word Kamikaze was known outside Japan before the attack on Pearl Harbor in December 1941, even though this word was not widely recognized. Scholars of Japanese history and probably others would have heard of the typhoon called Kamikaze that destroyed invading Mongols in 1281. Kamikaze was also the name used for two separate classes of Japanese Navy destroyers with the first ship in the first Kamikaze class being commissioned in 1905 and the first ship in the second Kamikaze class being commissioned in 1922. In addition, Kamikaze was the name of an aircraft that became famous in April 1937 as the first Japanese-built plane to fly from Japan to Europe. 2. There were no Jasukuni shrines erected in memory of Kamikaze pilots who died. The Yasukuni Shrine in Tokyo was established in 1869 for the remembrance of spirits of persons who died in battle for their country. These included the Kamikaze pilots. 3. Kamikaze pilots were not treated "better than even high government officials." Former Kamikaze pilot Norio Okamura in his interview with Robert MacMillan (1945) states that the Navy Kamikaze pilots got no preferential treatment at all and that some of younger men complained about this because they said they thought they ought to be given better treatment. 4. In real history, Kamikaze pilots did not receive medals and other rewards before they died in battle. 5. During the Battle of Okinawa almost all Kamikaze pilots flew more than thirty minutes before discovering enemy ships. 6. Kamikaze pilots did not wear "black tunics with special black buttons." This is an invention of the author's imagination. MacMillan, Robert. 1945. Kamikaze Pilot. Yank, November 30, 2-3.